There are hundreds of internet marketing strategies out there. Over the past ten years, I’ve devoured everything SEO. In fact, I sleep, eat and drink SEO. I’ve watched startups became giants through SEO. Multi-million dollar businesses like Buffer, Copyblogger, Mint, and Yelp. You need SEO more when you’re a local-based business. SEO is necessary in today’s world. You’re missing out if you’re not using it to market your business. Allow me to give you real reasons why you must invest in SEO. Search engines are the foundation of the Internet. Search engines are the quickest way to find any information you need. In fact, people are used to it. They ask search engines questions. Even the silly questions. Google presented me with some excellent results I may want to check out. I decided to click on the first result on Google search. It was, in fact, written by Jo Lewin, a nutritionist. Search engines’ ability to present expert information such as this is what makes them invaluable. 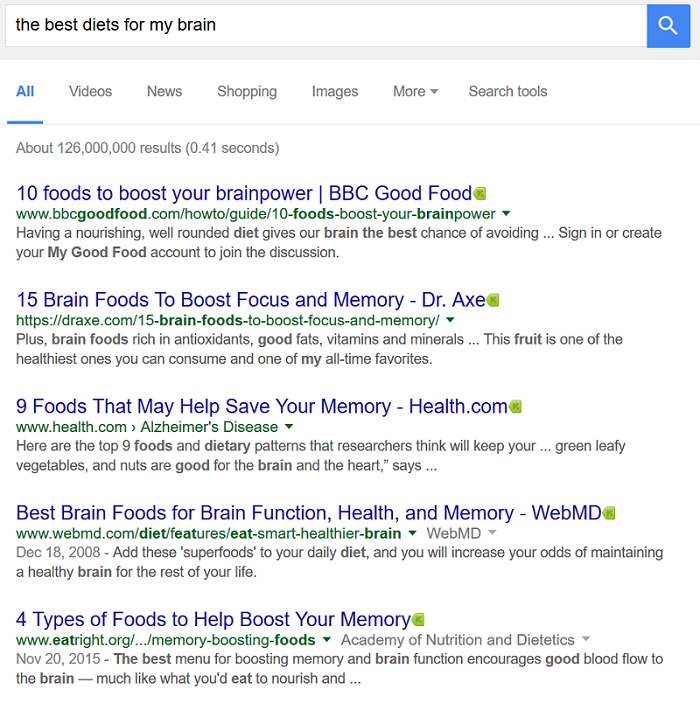 Now I know that foods such as whole grains, oily fish, tomatoes, pumpkin seeds and broccoli can boost my brain power. This is something I didn’t know a few minutes ago. 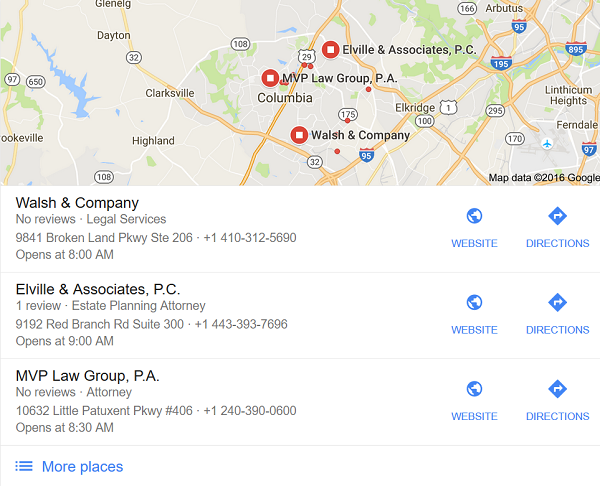 Search engines like Google can tell me the estate planning attorneys in Columbia, Maryland like Elville & Associates. Google can also tell me the best place to eat cool Mediterranean foods in Dallas. So search engines aren’t dying. At least, not anytime soon. Well-known brands find that at least 30% of their visitors come via a search engine, rather than typing in the website address of the individual brand. According to a study conducted by Groupon, 60% of their traffic are actually organic search traffic. Keep in mind that this is a business that is listed on the NASDAQ stock exchange and has a market capitalization of $2.87 billion (at the time of writing). Yelp is another brand that heavily relies on search engines. According to SimilarWeb, Yelp receives 69% of its traffic from search engines. 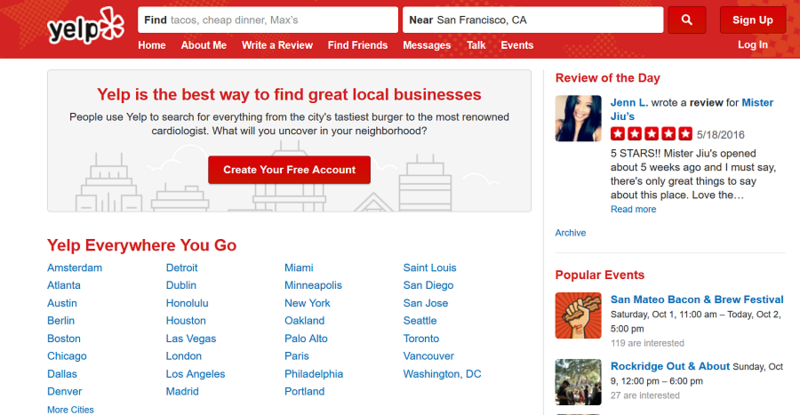 This shows that search engines are very crucial to Yelp’s survival. You should also keep in mind that Yelp is currently listed on the New York Stock Exchange. And it has a market capitalization of $3.17 billion (at the time of writing). I will assume that your product is less popular when compared to these brands. The lesser popular your product or brand, the more you need search engines to create more awareness. When you do the right things, search engines will attract a lot of potential customers to your website. You need to be the number one on search engines when prospects search for anything related to your product or brand. Even your top competitors want to be number one on search engines. Search engines are the largest single source of web traffic. 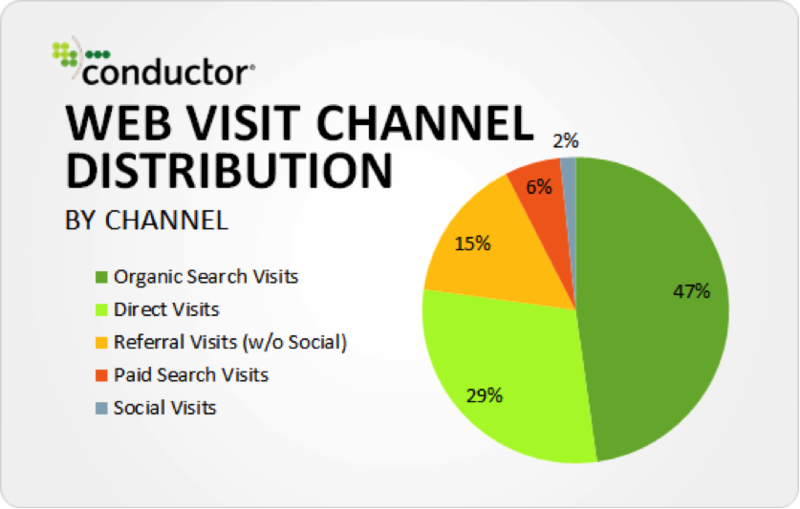 According to a study by Conductor, 47% of traffic come from organic search. When people are looking for something online, they go to a search engine first. You have to start showing up on search engines. Or, you’ll be missing out on a lot of potential sales. Who knows how much that could mean to your revenue? Depending on where your website is ranking on search engines for a commercial intent keyword, you could have the biggest market share in your industry. When I say search engines, you may wonder why I always mention Google. Google controls about 90% of the world’s search market. That’s why it makes sense to prioritize Google ahead of other search engines. Google has been the best search engine for decades. Their search algorithm presents you the best, most relevant search results. Google is very fast in the way it responds to search queries. But this doesn’t mean that you shouldn’t rank on other search engines. Bing is not that bad. According to ComScore, they get about 122.8 million searches per day in the US alone. And according to a report published by Search Engine Land, Bing controls 33% of the US search market. So you shouldn’t neglect Bing. And don’t forget that Yahoo is there too. When properly implemented, SEO can provide immense value to your business. People are more likely to end up on a website via a search engine than going directly to it. In fact, according to Jupiter Research, a Forrester Research company, 81% of users find their desired destination through a search engine. So what about other marketing strategies like social media marketing, PPC, sponsored ads and others? Is it that they are not effective? But they are not as powerful as SEO. For example, SEO is more effective than PPC. 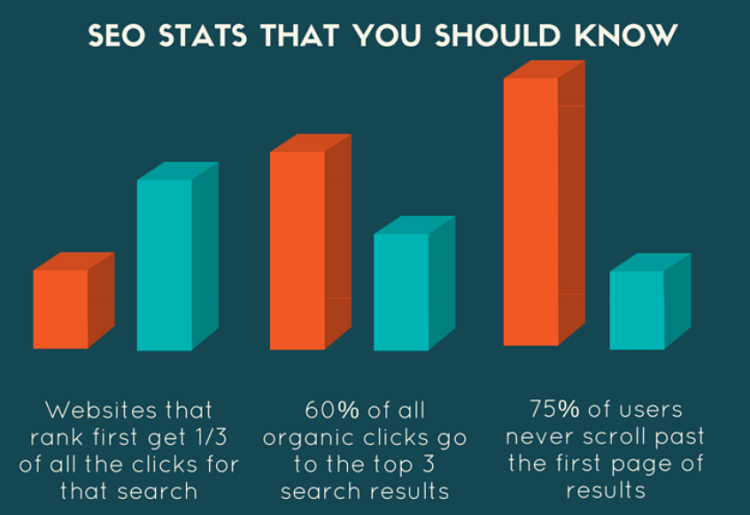 According to a study by published on Moz in 2008, for every 1 click on a paid search result, the organic results generate 8.5 clicks (this is on a keyword parity basis, not counting those search results that have no paid ads). Of course, 2008 is a long time. I found a more recent study to solidify my claim that SEO is better than PPC. 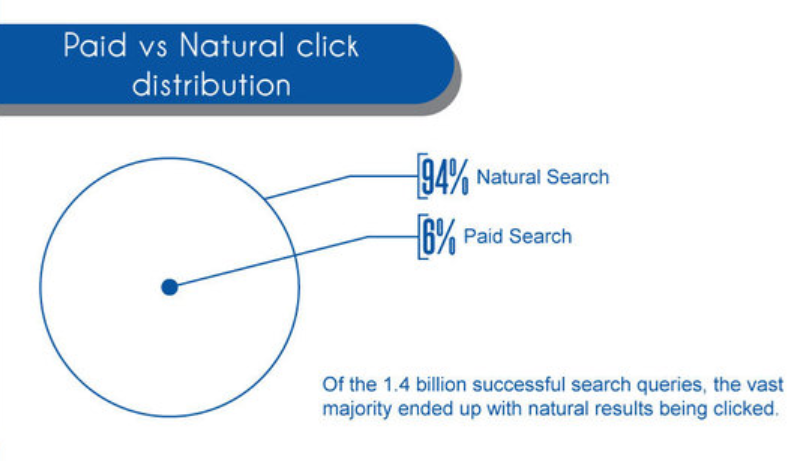 Research conducted by GroupM UK and Nielsen in June 2011, and published by eConsultancy showed that people click on organic search results 94% of the time. You’ll agree that it’s a huge gap. It shows people don’t like clicking on ads. They want the real search results. Most web savvy users like me often skip past paid ads without even noticing them on search engines. I’ll say that SEO isn’t very effective and smart if you’re in business for a short time. But when you’re in it for the long term, choose SEO. It’s highly recommended. SEO clearly offers more to the long term lifeline of your internet marketing. 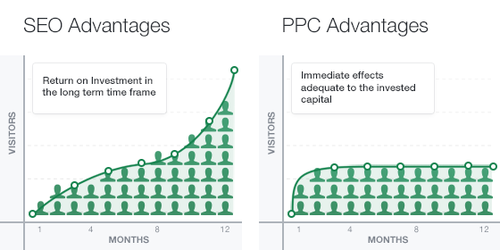 You won’t rank number one overnight, but it provides better results and more effective than PPC. Over the past few years, they’ve been a lot of talks that SEO is dead. This has made business owners and startup founders shift their marketing budgets to other marketing channels. They aren’t quite sure if SEO is really worth it. Or, they believe that SEO is a game or gamble. And they aren’t just willing to play it. The reality is SEO is not dead. SEO will never die as long as search engines continue to exist and people continue to use them. SEO used to be very easy until about six years ago when Google unleashed Panda and Penguin. SEO has been getting harder and harder since then. So because it’s no longer easy as it used to be, some marketers decided to proclaim it dead. Many tactics that are under the easy SEO umbrella can be considered dead. These SEO tactics don’t work. The lazy SEOs can’t do the hard, boring stuff so they would rather have their clients move their budget to other marketing channels they can easily control. SEO is going stronger every day. And as I said above, top brands such as Yelp, Groupon and Godaddy still heavily rely on it. SEO has become a totally different ball game. SEO is making high-quality contents that provide immense value to the search user. Quality content isn’t that easy to create. It takes time, research and a lot more money to create high-quality content. The old SEO is all about writing a content within 30 minutes and putting it on your website. With a few shady tactics, you’ll see it ranking on the first page for your target keyword within a very short time. But the old SEO method no longer works. The hardest part of the new SEO is getting quality and relevant links. Don’t forget that you also need quality contents. Not just quality links alone. By doing these, you’ll make both On-page and Off-page SEO more efficient for your business. Despite the rise of various social media channels, SEO continue to be the best of any inbound marketing channel. For example, SEO leads inbound marketing conversion rates, netting 15% above the average conversion rates. You want the marketing channel that provides the best return on your investment. And that is SEO. 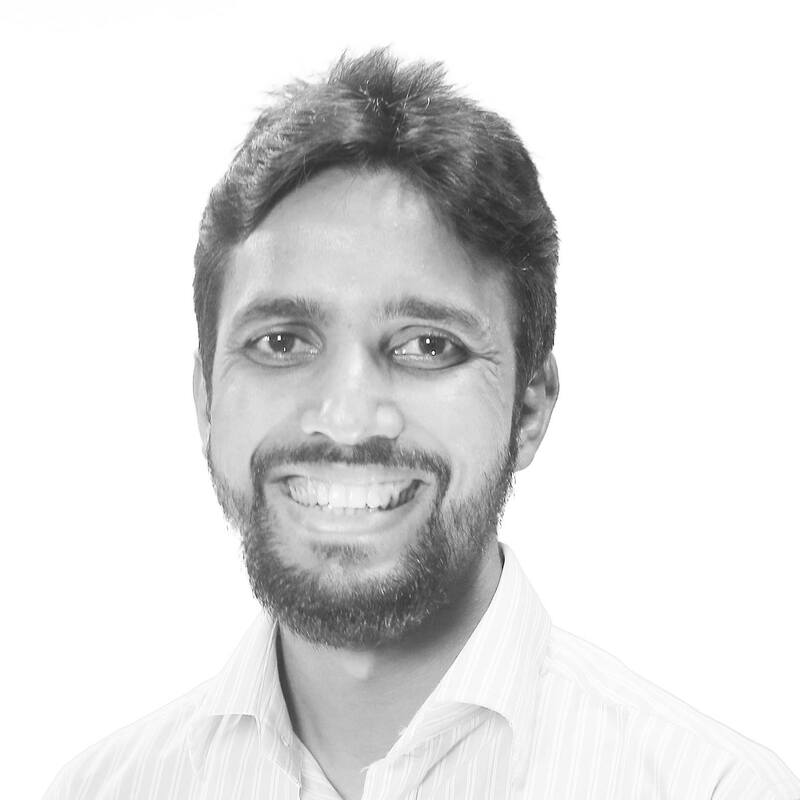 “While there is no standard return on investment with SEO that can be applied to every business, virtually every client experiences at least a 100% return on investment with their campaign. Studies have shown that 40% of well-managed SEO campaigns yield a 500% or greater return on investment. There’s tons of potential when it comes to SEO, it’s just a matter of making a small upfront investment with a quality SEO company to get the site ranked. In fact, their studies show that companies can generate up to 400% ROI. 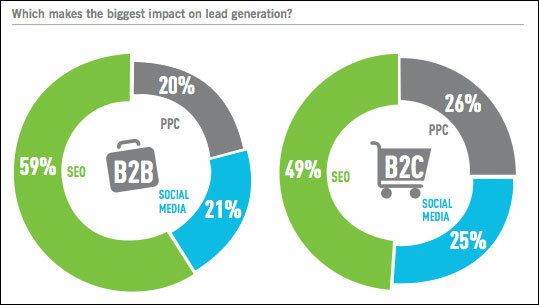 And according to SEO Reseller, SEO makes the biggest impact on lead generation. Your ROI is the only thing that matters when it comes to choosing the perfect marketing channel for your business. If you can maximize your ROI from a marketing channel, and sustain it over the long-term, then it’s the perfect channel. The good news is that SEO can give you just that. SEO isn’t hard to manage when you have the right skills. 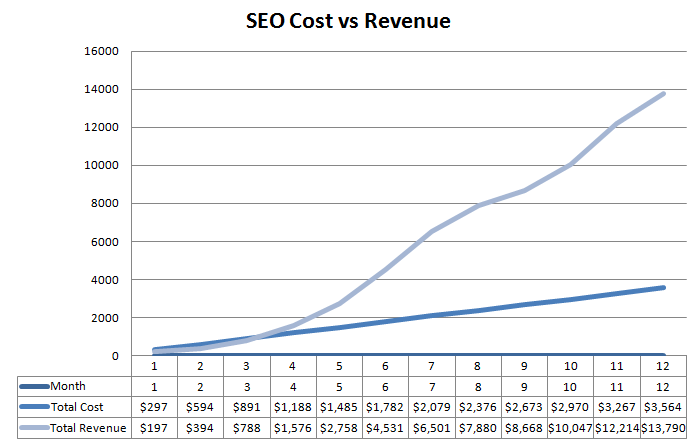 But as said above, the short-term ROI of SEO may be low. SEO is more effective when you’re willing to do it for a long time. Six months to a year is the minimum before you start seeing real results from your campaign. By then, your new SEO investment will simply build upon your previous investments. Profits may jump through the roof as a result of your patience. Execution is also a key. When you do the right things, results from SEO is much faster. Some people will complain about not seeing fast results from their SEO campaign. But the truth is most of them spend their time and resources doing the wrong thing. They will tell you they are doing SEO when in fact they aren’t doing it right. To succeed with SEO, you must apply the right tactics. For example, you need to target the right keywords that prospects are more likely to type into the search engine. For example, if your business sells shaving razors, targeting keywords like “men body creams” or “men beauty” isn’t an ideal. Yes, men are searching for these keywords, and they may need your product (shaving razors). But the truth is that most visitors who come from these keywords won’t buy your product. It’s a waste of time and money targeting the wrong keywords. That’s one wrong way to do SEO. Another wrong way to do SEO is when you focus too much on on-page optimization when you should be busy publishing new contents on your website. There are lots of wrong things you can be doing. Or, doing things when there’s no need for them. By properly executing your SEO campaign, you’ll reap great rewards down the line. Search engines play a big role in how people compare your business to competitors. A majority of web users will rely on Google to give them answers about a particular brand. Controlling what people see about your brand is very important. If you refuse to invest in SEO, competitors might hijack your brand and display negative information about you. They could portray you as the bad guy in the industry. There’s no way you’ll be aware of this if you aren’t investing in SEO and controlling the information that’s out there. What people see on the first page of Google when they type in your brand could make or break your business. Most of your competitors are smart to know that this happens a lot on the web. So they do everything to protect their image on search engines. It makes them smart. And smarter than you if you’re not investing in SEO. Start investing in SEO today. And you’ll thank yourself for it. If you are planing to do local SEO, here is an in-depth Local SEO Guide that can help you more. Please share this article on your favorite social network to spread the word. Thanks in advance. The post embellish the urgency Of SEO perfectly. However, understanding the right branches of SEO for your businesses keep you up to the long run. 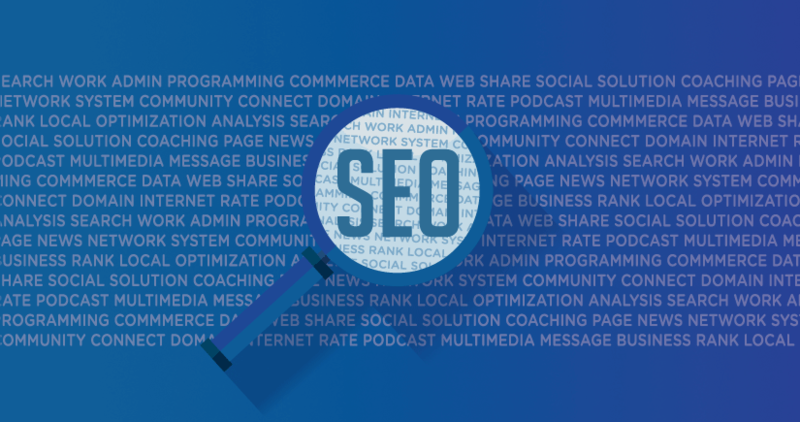 There are many different forms of SEO out there for both large and small businesses. I hear “SEO is Dead” from experts only because they are referring to SEO being dead for those that are not SEO experts. 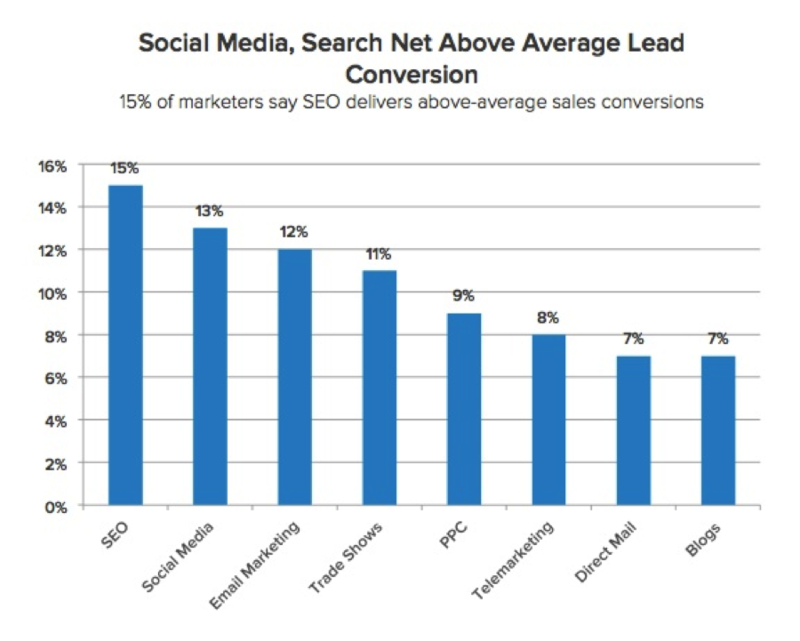 There is no way any small business can take more of a market share from a company that hires out it’s SEO or has their own SEO expert on staff. 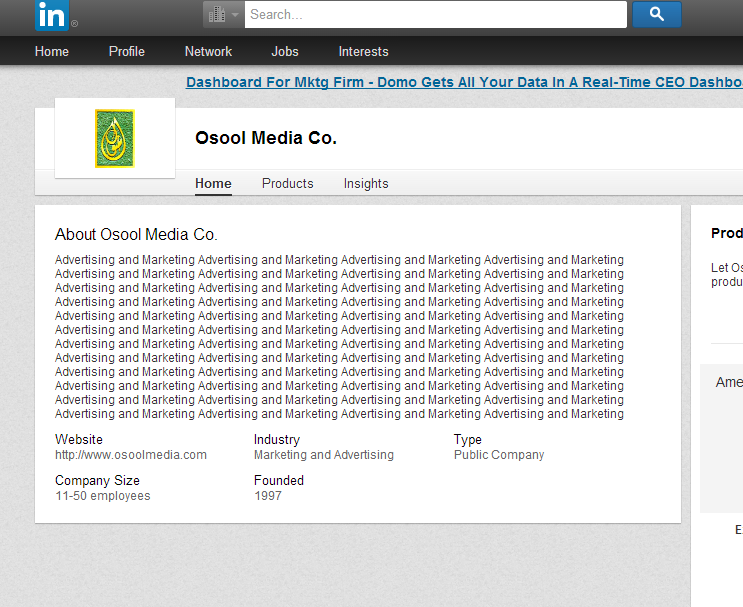 SEO is just too complicated in today’s world. This does not mean you can’t do your own SEO and still gain major benefits. I see clients of mine that were doing just fine before I stepped in to help them. They simply wanted more market share then what they were getting with their own internal efforts and when you are in a competitive land scape a good SEO company will win every time over a small business doing it’s own SEO.